More about Tar Shampoo Bring the beauty of the 19th century Tar shampoo into your next bathing experience. 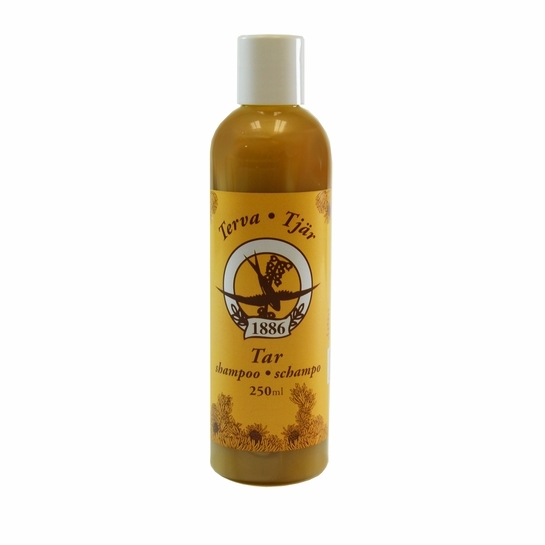 This Tar shampoo is known for its distinctive golden color and genuine fragrance of rich pine tar that enhances the cleansing of the scalp and mind. Softly foaming, this natural vegetable-oil based shampoo is gentle and suitable for washing various types of hair. The Tar component is made to help control itchy scalp and dandruff. Made with raw materials this genuine Pine tar is perfect for everyday washing and cleansing. Ingredients INCI: Aqua,Sodium Laureth Sulfate, Cocoamide DEA, Propylene Glycol, Disodium Laureth Sulfosuccinate, Cocamidopropyl Betaine, Glycol Distearate, Isostearamidopropyl Morpholine Lactate, PEG-200 Hydrogenated Glyceryl Palmate, PEG-7 Glyceryl Cocoate, Sodium Chloride, Phenoxyethanol, Glycerin, Cocamide MEA, Laureth-10, Disodium EDTA, Methylparaben, Citric acid, Ethylparaben, Propylparaben,Pyroleum Pini Pix Liquida. When I heard of Tar Shampoo, I envisioned institution-style odors, like Ivory soap. I decided to be daring and ordered Tar Shampoo as a Christmas gift for my man. His hair got all silky and fluffy. I sneaked the bottle away from him and used it myself, at least once. Same result. It smells fairly potently of tar while you wash your hair, but the smell dissipates as the hair dries. Very good product.